In 1902 Glenferrie Road still had paddocks and houses. Its commercial expansion into the shopping mecca we know today began in the Edwardian period of architecture from 1901 to 1918. Built in 1920 on a vacant lot with a stream running through it, the architects of the RSL Hall and shops were Richardson and Woods, who started practicing in 1914. Strictly speaking, the hall was built outside the Edwardian era but has many Edwardian features, including rusticated stucco, pier and ball, arches, arched parapet, tapered pylons and iris-shaped glazing to the doorway. The stream is now underground, but its course can still be traced both in the brickwork under the shop on the corner of Oxley Road, and in the curious shape of the allotment of the buildings next to the hall and shops. The shops, whose facades have been altered, were built later over the creek. The first stone of Immaculate Conception was laid in 1867, but later changes introduced elements of Edwardian architecture to the building. In 1913 work began on the sacristies, with the eastern transept and spire completed after 1919 at a cost of £16,000 by the architects, Reed, Smart and Tappin. 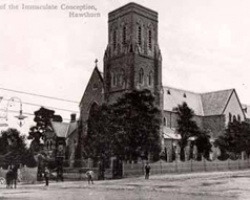 These architects were also responsible for Sacred Heart Catholic Church in Rathdowne Street, Carlton; St John the Baptist, Clifton Hill; the chapel at Mary's Mount in Ballarat and Bendigo's Sacred Heart Cathedral. 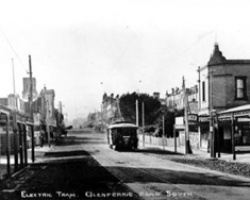 Take a moment to consider the impact that trams and trains have had on Glenferrie Road and its reputation as a shopping hub for Melbourne. The train line was extended from Hawthorn to Glenferrie and Auburn in 1882, but it took two major transport developments to really establish Glenferrie Road's reputation. On 30 May 1913, one of the first electric trams in Victoria travelled from High Street, Malvern, to Barkers Road, Kew, and back, amidst great celebration and with much bunting. The tram route had 10 points of contact with the railway, and served 7 municipalities and bordered 3 others, representing 175,000 people. Even then it was an obvious game-changer for Hawthorn traders, with the Hawthorn and Camberwell Citizen newspaper reporting 'with support there is no reason why Hawthorn should not become an important shopping centre'. 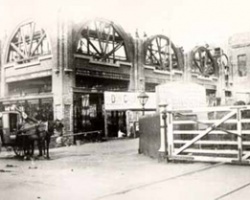 The second major event occurred in 1918-1919 when the train line was raised and the railways built the shops surrounding the railway bridge. 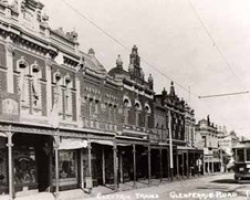 In Hawthorn, the rise of the picture theatre saw the opening of the Glenferrie Theatre in 1912. You can read the original newspaper article announcing the opening on Trove. And then in 1916, the Palace Theatre opened nearby. You can read the original newspaper article describing the new building under construction on Trove. The Glenferrie Theatre was built on the site of the old St John's school. There was a tea room on the left, which was initially called Barnard's and then Heep's, and on the right was a billiard saloon run by Horace Dawson and later Crawford and Simpson. From 1927 the Glenferrie Theatre became a Palais de Danse and in the 1930s it opened as the New Glen Picture Theatre which had closed by 1956. The building, with an altered facade, still stands today and in 2015 reopened as the Lido Cinemas. Unfortunately, the stunning Palace cinema no longer exists and is now the site of Coles supermarket. Historic mansion Toolangi, at 733 Glenferrie Road, was built circa 1905 as a doctor's surgery and residence for William Clayton, physician and surgeon. The building next door, 735 Glenferrie Road, was built in 1912 as the Hawthorn Motor Garage. From the 1920s the garage was run by Albert James Kane and family who had it for 20 to 30 years. They introduced the first electric petrol pump in Hawthorn. When visiting this immaculate building, which still stands, note the arch and the ball and pier on its facade. The Hawthorn Motor Garage building is now classified by the National Trust of Australia and is on the Victorian Heritage Register. It is the oldest known purpose-built motor garage in Victoria. It's also a rare example from an era when petrol was sold from cans inside the building, before the introduction of bowsers. Shopping in 1902 involved personal service and specialised offerings. Delivery was a common feature of shops, with items from ice and wood to meat and fish brought to your door. The shopkeeper more often than not lived over the shop. The shops at 752-754 Glenferrie Road were grocery and greengrocery shops. On this corner you would have found Bennett & Woolcock, Moran & Cato and Frank Crotty. 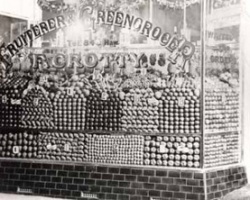 Frank Crotty was a greengrocer in Glenferrie Road from 1909 to 1929. First, he operated from the corner shop but when Moran & Cato purchased both shops they opened a grocery store on the corner, and Crotty moved to the lesser location next door where he continued to run his business until 1929. 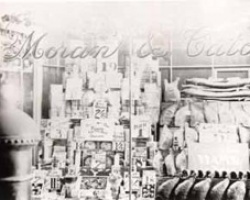 Moran & Cato date back to 1881 when Frederick Cato and Thomas Moran set up their grocery store partnership. By 1890 when Moran died, there were 35 stores. In 1909 the firm expanded to New South Wales and Tasmania and at the height of their expansion had about 160 stores. Similarly, Bennett & Woolcock, whose shop was on the opposite corner, were a renowned chain of butchers, which commenced business in the late 19th century. In 1905 they had 13 shops including three in the city and others in Carlton, Collingwood, Clifton Hill, Fitzroy, North Melbourne, Windsor and Richmond. Later they expanded further east to Hawthorn. 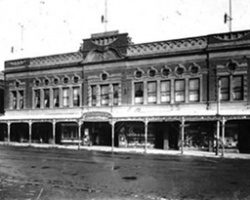 The arcade was named after the Don Cash Trading Co. which opened its department store on the corner of the Railway Arcade and Glenferrie Road on 18 March, 1910. You can read the original newspaper article announcing the opening at Trove. The architects were Ward and Carleton, and its ground floor at that time was said to have been the largest undivided space in the Commonwealth. The building and opening of this very early department store aroused great local excitement and four constables were needed to keep the crowd restrained at the opening. The department store has traded and been known in Hawthorn under three names. It was called the Don from 1910-1915, Snows from 1915-1933 and Walkers from 1933-1967. Observant passers-by will notice that there is still a sign in the floor of the arcade for 'Walkers'. When you've reached the end of your walk, you can learn more about the history of the area from the resources listed on research your local history. 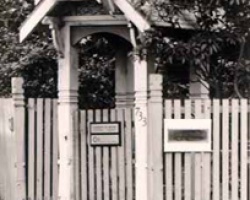 Other Hawthorn history walks are available from the Hawthorn Historical Society.